← I can add stamps by both annotation and comment with VeryPDF PDF Editor, what is difference between the two ways? PCX is a kind of image format which was the native file format for PC Paintbrush and became one of the first widely accepted DOS imaging standards. PCX is a raster image format, the file header stores metadata about the image, separately from the actual image bitmap. PCX files commonly store palette-indexed images from 2 or 4 colors to 16 and 256 colors. PCX file is consisted of three main sections:File header,Image data and Color palette. The PCX file format has mostly been replaced by newer image formats, but is still used by some fax and scanning applications. Multi-page PCX fax documents use the .DCX extension. 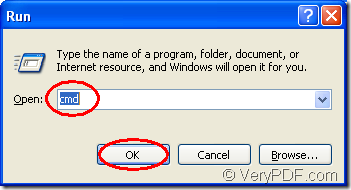 If you want to convert rtf to pcx format file,you can use HTML Converter Command Line which can be downloaded at http://www.verypdf.com/htmltools/htmltools.zip. 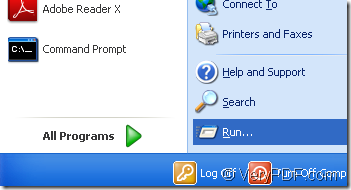 You can visit http://www.verypdf.com/htmltools/index.html to read the main introduction of HTML Converter Command Line. Here are the steps to convert rtf to pcx.If you are being confused by this problem,you can read this article.May you can get something useful. 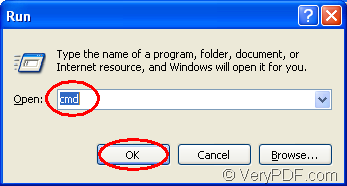 Cmd.exe program can be opened by two ways.The regular one is clicking “start” – “run” ,in popup dialog box you can input “cmd” in “open” edit box,then click “OK”.Please see Figure1 and Figure2. 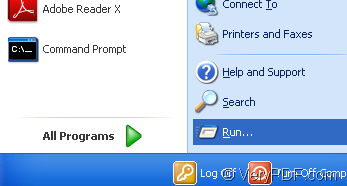 The other one is hot key.You can press “Windows” + “R” to open the dialog box showed in Figure2. The command lines should contain called program,source file and target file or not.Please see Figure3. "C:\Documents and Settings\admin\Local Settings\Temp\htmltools\htmltools.exe" is the path of called program—htmltools.exe which is the key of conversion.It is also the executable file in HTML Converter Command Line. bells.pcx is the name of target file,including file name and extension name. 1.“result=OK” showed in Figure3 stands for the success of the conversion. 2.You can specify the path of target file or not.If you specify the path,the target file will be saved in the location you’ve set.If not,it will be saved in current directory automatically. Step3.Find target file.Because there are more than one page content in source file,the target file will be “more than one”,too but without any content loss.Please see Figure4. If you want to know more about HTML Converter Command Line ,please visit http://www.verypdf.com/htmltools/htmltools-manual.htm and http://www.verypdf.com/wordpress/. This entry was posted in HTML Converter (htmltools) and tagged rtf to pcx. Bookmark the permalink.